Unlike other restorations such as dentures and bridges, dental implants replace both the crown and root of missing teeth. The other options merely rest on top of gum tissue. 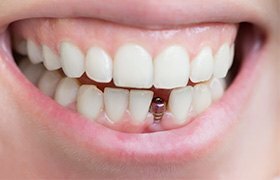 A dental implant, on the other hand, consists of a titanium post that is surgically embedded in your jawbone and the restoration that completes your smile. When you come to D’Amico & Mauck for your dental implant, the dentist has already completed a detailed plan to guide the proper placement of your new tooth. With X-rays, photos and measurements, you can rest assured that whether you are receiving one or more implants, each one will be positioned for the greatest security in your jaw. The procedure begins after the local anesthetic has taken affect. Then the dentist makes a small incision in your gum and exposes your jawbone. 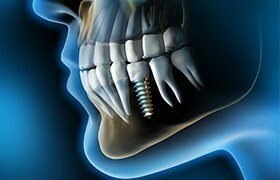 The biocompatible implant is then surgically positioned in your jaw to take advantage of the greatest bone density. Most patients that have one dental implant placed are able to return to work or school after their appointment. However, if you need more than one implant, then you may need a couple of days to rest. While you recover, be sure to drink plenty of fluids, eat soft foods and brush gently around the surgical site. You can gradually add solid foods, but try to chew more on the other side of your mouth in order to give the tissue flap covering the implant sufficient time to heal. The answer to that question depends on how many dental implants you’ve had placed. A single implant takes around six months, while several may require up to nine months or more. A lot happens below the surface when you have a dental implant. The post and surrounding tissue integrate to form a solid foundation for your eventual tooth restoration. Called osseointegration, this process is slow, but well worth the wait. You’ll never have to worry about dentures slipping or a bridge coming loose when you have the security of dental implants. What is the Cost of Dental Implants in Aurora? The average cost of a dental implant in Aurora is approximately $2,000. Of course, the number of implants you need and the type of restoration required—a crown, a bridge or a denture—will all affect the final cost. Dental insurance plans often cover a portion of the cost of the restoration, so be sure to check the details of your coverage. If you brush and floss your teeth well every day, then you can expect your dental implants to last a lifetime. Also, don’t forget to schedule regular dental checkups twice each year. At these appointments, we will be able to ensure the integrity of your implants and check for any signs of infection.